Hydrangea flowers are big and showy, with many packed into a cluster. The blooms are often a soft pink, blue or a light shade of purple. The reason for this is related to the growing conditions it receives. White flowers are most common in many of the species in basic soil. The soil condition has an impact on the color that will develop. Acidic soils produce blue while alkaline produces pink and purple. 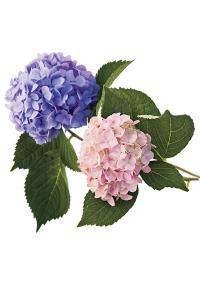 The hydrangeas species includes over 70 varieties of flowering plants. These are often summer blooming perennials that produce big blooms. The flowers are often called snowballs for their distinctive shape. The blooms are comprised of bunches of smaller flowers on thin stems. These bloom from late spring to early autumn, with summer the peak. Pruning the plant is often necessary to encourage new blooms to form. The average growth is between 2-5 feet tall, making it a large plant. Width can vary, but on average 3-4 feet is seen in many species. Taller or more compact versions are also possible with cultivation. Taller or more compact versions are also possible with cultivation. The bloom color may also be influenced by species or the soil type. This allows for more options when planning a garden or bouquet. Hydrangea macrophylla is a beautiful species that is native to Japan. It is also known as Bigleaf or Lacecap due to its leaf appearance. Blue, pink and purple colors are common for the petals of flowers. Within the macrophylla species there are many variations for color. The spread of the flowers and leaves vary within this species. Double blooms and clusters are often seen depending on the style. H. Quercifolia is a species native to the southern United States. White is the most common color seen in this particular version. Compact shrubs are also available for those with limited space. H. Serrata offers a different look for petals flower spreading. This is a vigorous plant that offers pale or brighter blue flowers. In more neutral soil, the petals are often closer to a pale color. Many of the species feature white flower appearance on the heads. In order to achieve other colors, the soil pH must be modified. Acidic soil will produce blue colors that range from pale to dark. A neutral pH will often produce cream, white or muted bloom shades. Alkaline soils will produce colors in the range of pink and purple. Some gardeners may alter pH in areas of the garden for this reason. Mulching is often used to help the plant retain enough moisture. Compost or leaf mold are popular choices to add before planting. This can also help to protect during the winter or cold weather. Full light or shade can be used, making them a versatile addition. Because of the size, they are often chosen to create privacy at home. Smaller versions may be used to separate paths in a garden or bedding. Hydrangea plants can be sold through florists, especially in places around Sterling Heights, MI, Baton Rouge, LA, Birmingham, AL, Clovis, CA, and Springfield, IL. Hydrangeas can also be made available for use in floral arrangements. The most common use for the cut flowers is to be dried for display. They retain color and shape for a long time after they are dried. This makes them popular for those who make dried arrangement pieces. Symbolism often varies with the most uncommon being a sign for vanity. Abundance and generosity are often associated with this plant as well. The conflicting symbolism often leaves the meaning up to the viewer. Many choose to use the more positive meanings for this type of flower. Expressions of gratitude are commonly thought of symbols and meanings. It is also thought to represent grace and beauty due to its petals. A bouquet may often contain one to three of the bloom clusters. These may contain other flower types as filler or just the blooms. A single hydrangea may also be used to make a graceful centerpiece.